Photograph, Picture of historical marker for James Judson Carroll and his wife's house. Image available on the Internet and included in accordance with Title 17 U.S.C. Section 107. CARROLL, JAMES JUDSON (1876–1938). James J. Carroll, lumber-company executive, ornithologist, and conservationist, son of Francis W. and Sarah (Womble) Carroll, was born on December 27, 1876, in Burleson County, Texas. His father, a Baptist minister, died about 1880, and he was reared by his uncle, James Milton Carroll, a prominent minister, educator, and historian of Baptist activities in Texas. Carroll became interested in the natural sciences at the age of twelve and eventually became an authority on the identification of birds. He attended public schools. In 1894 he enrolled in the preparatory department at Baylor University and in the following year in the collegiate department. He contributed specimens to the Baylor University Museum for several years before his appointment in 1901 as curator of the museum and university librarian. In 1902 he was relieved of the position of librarian, but he continued to work as curator until September 1903, when he left the museum to enter private business. His first articles on natural history were published in the Naturalist (1894) and the Oologist (1897–98). His most important work, published in the October 1900 issue of the Auk, consisted of an annotated list of 185 species of birds recorded in Refugio County, Texas. In 1903 Carroll married Lena Carter, daughter of lumberman W. T. Carter. Three daughters were born to this marriage. 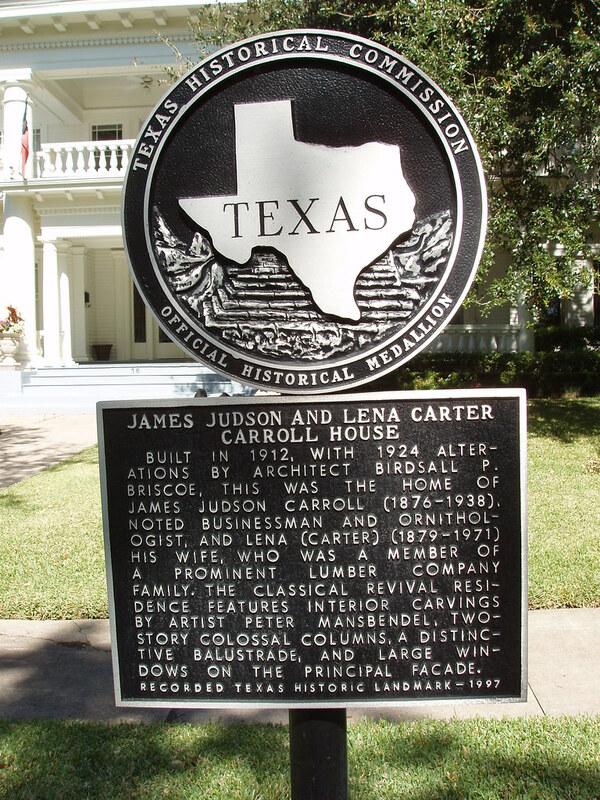 Carroll entered business with his father-in-law at Camden, Texas, and eventually became sales manager of the company of W. T. Carter and Brothers, vice president of the Carter Lumber and Building Company, and president of the Carter Lumber Company. After moving to Houston in 1908 he became a director of the Union National Bank, a member of the Houston Club, the Eagle Rod and Gun Club, and the Tejas Club; he was also an organizer of the Houston Open Forum. Carroll was a life member of the American Ornithologists' Union, a member of the National Audubon Society, an accomplished photographer of birds, and, in his later years, an ardent protector of Texas birdlife. Photograph, picture of gravestone(?) of James Jusdon Carroll. Courtesy of Find a Grave. Image available on the Internet and included in accordance with Title 17 U.S.C. Section 107. In 1926 he resumed his studies of birds. He published articles on the avifauna of the "bird islands" (1927), the white pelican (1930), the fulvous tree duck (1932), and the nesting of the robin in Houston (1935). Through his hobby of photography, he came to be an acknowledged authority on the birdlife of the islands along the Texas coast. In the mid-1930s he alerted the National Audubon Society to the hazards facing the birds nesting on the bird islands in the Laguna Madre. Through Carroll's efforts wardens were selected to patrol the islands and the Audubon Society secured leases to establish sanctuaries. In 1933 he suffered a stroke that curtailed his activities. He died at Houston on February 17, 1938, and, in accordance with his wishes, his body was cremated and the ashes scattered over the bird islands. In 1955 the second chain of bird islands, located in the Laguna Madre between Aransas National Wildlife Refuge and Matagorda Island, was leased by the National Audubon Society as part of the Robert Allen Porter Sanctuary. The largest of these six small islands was later named Carroll Island and a monument set thereon to commemorate the efforts of James J. Carroll to protect the nesting areas of Texas waterfowl. Carroll Island and the other islands of the second chain are today important nesting sites for great egrets, snowy egrets, reddish egrets, great blue herons, roseate spoonbills, laughing gulls, brown pelicans, and four species of tern. Ellis A. Davis and Edwin H. Grobe, comps., The New Encyclopedia of Texas (4 vols. 1929?). Houston Post, February 18, 1938. Frank W. Johnson, A History of Texas and Texans (5 vols., ed. E. C. Barker and E. W. Winkler [Chicago and New York: American Historical Society, 1914; rpt. 1916]). T. S. Palmer, Biographies of Members of the American Ornithologists' Union (Washington, 1954). Handbook of Texas Online, Stanley D. Casto, "CARROLL, JAMES JUDSON," accessed April 18, 2019, http://www.tshaonline.org/handbook/online/articles/fcabw. Uploaded on June 12, 2010. Modified on October 5, 2016. Published by the Texas State Historical Association.